Thanks to YooToo for sponsoring today’s post. Being a new mom can be hard and when you throw in breastfeeding challenges things can be extra tricky. I have breastfed 6 babies. I know breastfeeding comes with all kinds of ups and downs. What if I told you that there was one thing that made my breastfeeding journey so much easier every single time? Other moms gave me all kinds of “must-have” product recommendations while I was nursing. I tried most of them. The one thing that really and truly made my breastfeeding life easier though was a great quality nursing bra. A great nursing bra made a world of difference to me. You wear your nursing bra 24 hours a day. It is the single most-used baby item that you will own. Make it a good one. It’s hard to know what to look for when shopping for a nursing bra though, especially if you are shopping during pregnancy and aren’t quite sure what you are going to need. We have some tips (along with a fabulous nursing bra recommendation) for you. Being comfortable while you are breastfeeding is a must. It’s nearly impossible to get your milk to let down when you are uncomfortable or stressed so I made comfort a priority. The times I skimped on my nursing bra I ended up frustrated and sore. I love the YooToo Bra for so many reasons but comfort is right at the top of my list. 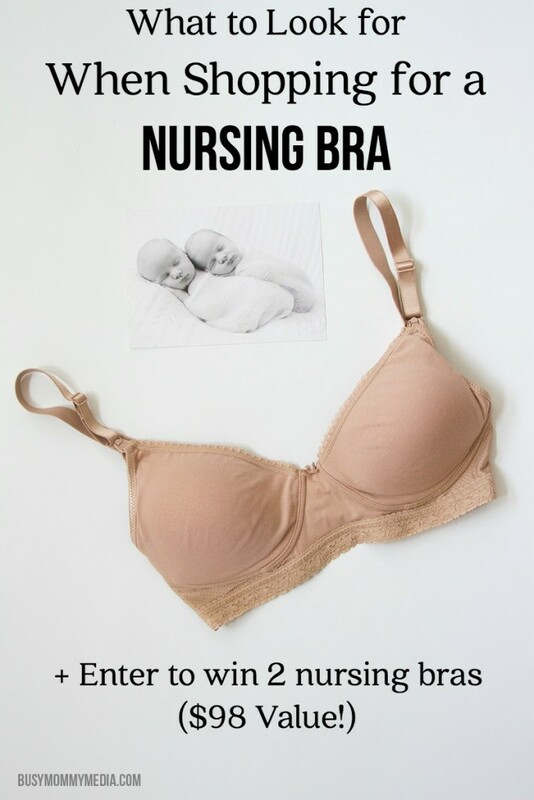 Many nursing moms (myself included) opt to sleep in their nursing bra at night and this one is definitely comfortable enough for sleeping, but still supportive enough for daytime wear. I love that it still has some nice details that make it pretty. Being comfortable doesn’t mean you have to give up wearing pretty things. This one can be a bit tricky, especially if you are shopping during pregnancy because your bra size changes so much. Even after your baby is born, your size will fluctuate a bit based on a number of things including, how recently you have nursed your baby to how quickly the baby weight is coming off. Look for a bra that will adjust with your size a bit. Some fabrics definitely have more stretch than others. You want something that will work with your changing body. YooToo has a patented Ugrow knit weave that is super soft and really moves and adjusts the way you need it to. It really feels like a second skin. Even the size of your rib cage will be changing once your baby is born. That’s tricky for sizing a bra because your band measurement will change dramatically so you need a bra that can accommodate that. The YouToo Bra has 6 hook and eyes so you can keep the fit you need without buying a new bra. If you are worried about finding the right size, many maternity stores offer free sizing consultations and they often have a good idea what size will work for you after your baby is born if you are shopping while pregnant. Padding is important in a nursing bra. Too much padding and it’s bulky when you go too nurse. Too little padding and you are risking your nursing pads showing through your shirt. Most moms are super sensitive while nursing too. Brush into something the wrong way or move your shirt too much and suddenly you are leaking milk. I have gone back and forth on this because generally I prefer bras with an underwire for support. Underwires can be tricky while nursing and often can lead to clogged milk ducts which is painful and can lead to infection. I was surprised to find that there are some great, supportive bras that don’t have underwires. I’ve dealt with three nasty cases of mastitis that I at least partially blame on a poorly placed underwire and I would not recommend it. I rarely get sick but mastitis did a phenomenal job of knocking me down. I’ve used a huge variety of nursing bras over the years and some were way more complicated than I expected them to be. You want a clasp that can be opened and closed with one hand because you’ll be using your other hand to hold your baby. If you want to have any chance at nursing discreetly in public, that one-handed clasp is a necessity. Want to win a 2 pack of YooToo nursing bras (a $98 value)? YooToo nursing bras come in size 32A all the way to 46I! They are super comfortable and really have everything we are looking for in a great nursing bra. This giveaway is open to the U.S. Winner must be 18+. Please see our site’s Terms and Conditions for a complete list of our contest and giveaway rules. Don’t put too much pressure on yourself. I think for me I had a mothers glow and knowing that this little life you created is here because of you should be all the confidence you need!!! I would imagine the mother’s comfort and happiness is the most important thing to look for when shopping for a nursing bra. I look for comfort and easy to use. Comfort it the number 1 thing that I look for!!! The number one thing I look for in a nursing bra is comfort and fit. I look for comfort but also durability in a nursing bra! I’m very interested in this brand!! I look for comfort and how easy it would be to use. The thing that is most important to me in a nursing bra is comfort. Thanks! I got professionally fitted at the place I went to pre-pregnancy. They put me in a 36I and I was too sleep deprived at the time to realize it doesn’t fit. This is one of the worst fitting bras I’ve ever had and I paid $80 for it. I need the right fit so it will be comfortable all day! The number one thing I look for is comfort! Comfort and adjustability would be important! I don’t want to have to keep buying new ones! Comfort and durability are two things I look for in a good bra, nursing or not. I like the feminine details on these bras and they look comfortable. Easy access is important. I do like the sleek design of this one. Something comfortable but also something somewhat cute and stylish. The most important thing is that it’s comfortable. My most important thing is comfort. I looked for comfort first and ease of access second. The main thing I look for is comfort, support and the right fit. I look for comfort and support! I look for comfort and easy of use when I’m shopping for nursing bras. I look for good support and ease of use, especially since I’ll be pulling my shirt up while using it. Price is a major consideration too. I look for comfort and support. Comfort is key and being easy to clip and unclip and proper fit! Comfort, price and ease to use. Comfort but also shape. I have had really comfortable ones but they made my shirts look horrible on me. I really like nursing bras that are comfortable to wear and are easy to use. Thanks for the give away. Comfort and ease of access are two important qualities I want in a nursing bra. It has to be comfortable or it’s a no go for me! Comfort is definitely the most important thing! And ease/convenience is a close second! I look for comfort and accessibility to feed the baby without looking the support of a bra. I look for comfort as there is nothing worse than having a nursing bra that hurts when you wear it. I always look for comfort in a new bra. Comfort is the most important thing! Def comfort. That’s the only thing I really care about. I have one nursing bra, it is horrible! Do you have any Pokémon fans at your house? These Pokémon Ball Corner Bookmarks are the perfect craft project for Pokémon fans and a great way to jump start your summer reading. Whether you want a fun craft for a Pokémon themed party or are just looking for a project to do after watching the new Pokémon movie, this Pokémon bookmark is a great one!